I have now sampled twelve varieties of the Gourmesso range and there isn't one I did not like. Even their Decaf tastes great. We usually buy Lavazza, San Marco or Segafredo to make a strong but smooth espresso-style coffee or cappuccino, so these are the brands I used as comparatives. 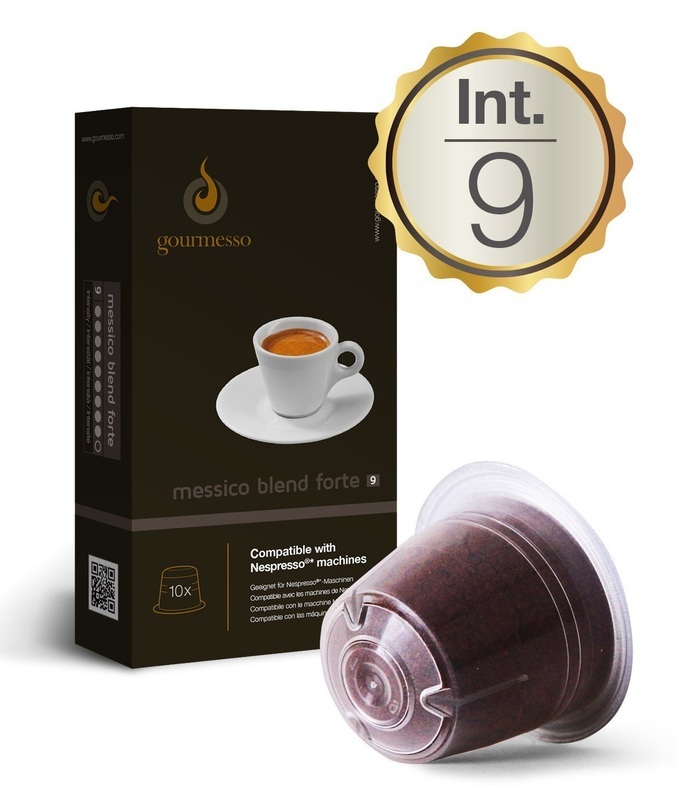 Gourmesso offer a large range of roasts, graded for intensity from 3 to 10. I requested their strongest blends because that is the hardest test for coffee. Gourmesso passed the test with flying colours. Even the most intense, darkest roasts I tried (Etiopia Blend Forte and Messico Blend Forte) taste surprisingly smooth and not at all bitter. India Forte, Tarrazu Forte and Nicaragua Mezzo are full-bodied and velvety. Bolivia Pura Mezzo (classed as an 8) makes a pleasantly strong brew with a convincing dark roast punch. Each package contains two pouches of five individual capsules each, sealed in foil. You cannot go wrong with dosage and preparation. Ideally, I love to press a thick crema out of my gorgeous Pavoni, but the temperamental thing is again in need of maintenance and I haven't found anyone local who can do it justice, so I'm back to using my trusty, old-fashioned Bialetti moka machine. Just for fun, I opened the capsules and used the loose coffee in the Bialetti with outstanding results. The Gourmesso brand was a very pleasant surprise. These coffee blends are top quality but very affordable and I can easily recommend them to anyone who enjoys a genuine, full-bodied espresso or cappuccino and, with so many varieties, there is bound to be one you'll love. 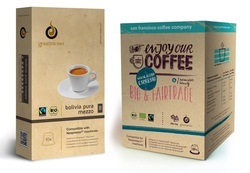 It's also good to see the Fairtrade and Bio logos, reminding us that commerce does not have to be heartless. Special flavours: Soffio di Vaniglia, etc. Each has its own individual character but if I had to choose, I would probably pick the chocolate or hazelnut, although it really depends on my mood. You may want to taste every one of the special flavours before deciding that you like them all, or one will become your favourite. Either way, be warned: they can become addictive! Again, the capsules are packaged in five pouches of two each, sealed in foil. 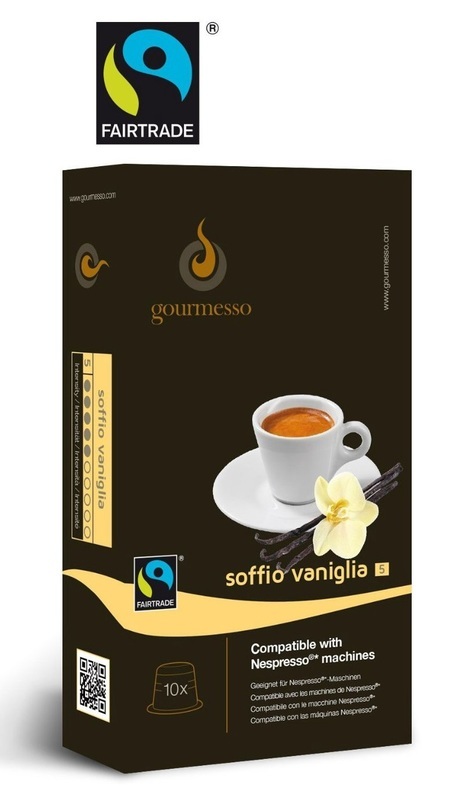 These flavoured coffee blends are distinctive but they still taste primarily of coffee, which is very important to me. They are perfect for anyone who enjoys a slightly decadent coffee experience, and some variety in their espresso or cappuccino fix. As part of the samples Gourmesso sent me for evaluation, this is a most intriguing variety. A collaboration between the San Francisco Coffee Company and Gourmesso, and produced with accreditation from the Bio and Fair Trade organizations, which makes it all the more worthwhile. This well-balanced house blend has the body and taste I like. Each package contains ten individual capsules, sealed in foil. As I said before, I prefer to make my coffee with a Moka or Espresso machine, so I can fine-tune the amount, but if you use a Nespresso coffee maker, this blend will give you a very good idea of what true espresso should taste like. 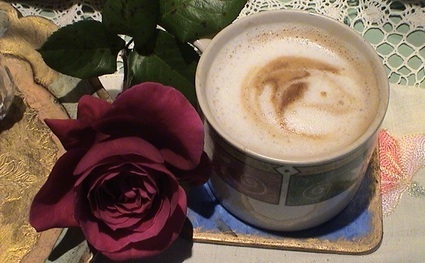 There is a little bite after the initial smoothness, and enough body to make a satisfying cappuccino. Beans from Central America are known for their smoothness and the roasting seems just right. At this price level, this is an excellent choice.